I started making bread a while ago, after attending a free bread making workshop where we were given some sourdough starter. Then überjoi gave me the Bread and Butter Project cookbook, which provides a really excellent starting point, giving some solid recipes and instruction. The actual idea behind the book is pretty awesome as well. Another fun aspect of bread making was growing and maintaining my own sourdough starter. I’ve now gone through most of the sourdough recipes in the Bread and Butter book and have also made a few custom variations using different flours I’ve found in shops around the place. Using a starter (over instant yeast) adds so much more flavour to the bread. It’s also pretty cost effective as well. The problem is that making really good bread is a time consuming business. You need to be around to knead, knock back and proof things for the correct amount of time at the right time. I really enjoy making sourdough bread but finding the time to make it properly is a little difficult sometimes. It’s frustrating to spend a day preparing your starter and dough only to get distracted, overproof your bread and have it collapse in the oven. Still, even if I’m not making bread very often I want to keep my starters alive. I’ve ended up maintaining both a white flour starter as well as a rye flour starter and have now been using the excess to make sourdough crumpets. 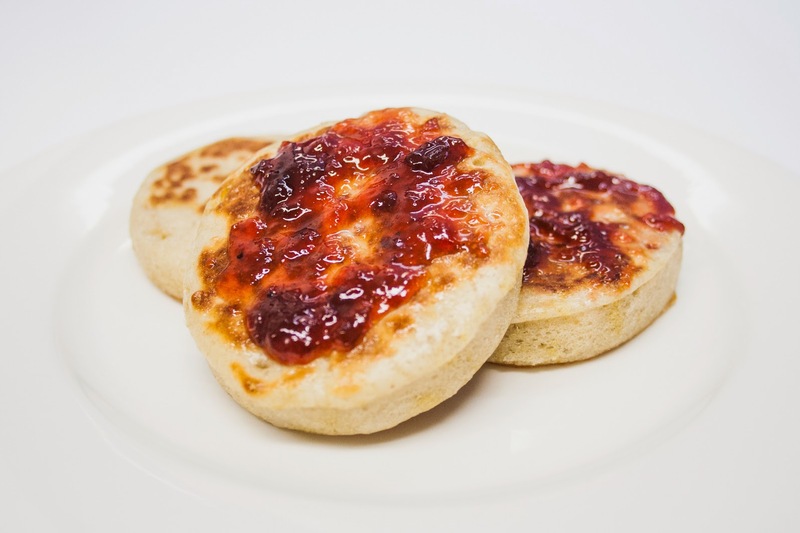 These crumpets are a great way to use up excess starter. Even though they’re 99% starter, they don’t have a sour taste (thanks to some sugar and baking soda). They’re really easy to make and are also pretty tasty. Creating a sourdough starter from scratch will take a couple of hours of your time (spread out over a week). There are lots of sites detailing how to make a starter from scratch – such as this one. I got my rye flour starter going by taking a bit of my white flour starter and just feeding it with rye flour for a few days. Note: This recipe is originally from here with my addition of using the rye starter. When I make crumpets for myself I just make little free-form crumpets in the pan. When I make them for überjoi I use a mould so they look “nice”. It’s up to you. Make sure you grease the moulds if you choose to use them. Set a frying pan on medium-low heat and add some oil. Oil your moulds and add them if you’re going to use them. Mix the starters, sugar and salt in a bowl. Once the ingredients are combined and the pan hot, add your baking soda to the bowl and mix again. Add the mixture to your pan a spoonful at a time. The mixture will rise so don’t overfill your moulds if you’re using them. The crumpets should now take 5-6 minutes to slowly firm up. Make sure the heat isn’t up too high or they will start to burn on the bottom. I tend to put a lid onto the pan to speed up the cooking a little, but this will reduce the number of holes on the top of your crumpets. It’s really up to you if you do this or not. When the crumpets are set on top, flip them over for 30 seconds or so to brown the top. That’s it. Crumpets done. They’re ready to eat from the pan but if you’re making them to eat later I would suggest toasting them then adding your butter or jam or honey or Nutella or whatever you want to eat them with. The end.